Thinking about perennial combinations in the middle of winter is folly of course but what else to dream away a miserable dull winter day? The hak is Japanese hedge grass and it has practically no down time at all. In spring all it needs is to be whacked back to the ground the minute there’s new growth and it will be popping out looking absolutely great. 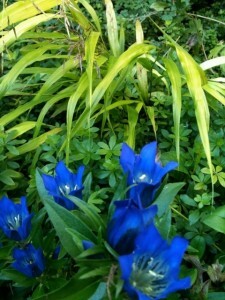 You have to wait until late summer for the gentian to look this good and for this moment. They are glorious plants and that blue is so intense it carries for a huge distance. But what’s so smart about this combination is that the gold background makes it pop even more than usual. This is an Asian gentian and hardy to Z5 but it needs sun though not hot full sun and must have really well drained soil. What a great genus because there’s a gentian from almost every part of the globe and it’s a fantastic plant to collect. I’ve tried G. septemfida but ignored the well-drained part and it drowned in the spring flood. Next time I’d put it in a raised bed with lots of organic matter in the soil. If you have a combination that’s as stunning as this one, send it to me and let me comment on it. I’ll throw in some of my own as well. It’s going to be a long winter. What a great way to prepare for the gardening season ( it will come). There seems to be too much emphasis on garden problems and what went wrong, and, whereas we can learn so much from our mistakes we also need to take stock of our successes. I will forward one of my favourite combinations soon ( when I can figure out how to do that). Whole Handle Marketing Review- Good piece of particulars which you?ve received on this internet site write-up. Hope I could quite possibly get some a lot a lot more of the things in your own internet web site. I’ll arrive once more.